Seaman High School students got a high-energy start to the week thanks to the ASA High School Tour, sponsored by the U.S. Marines. 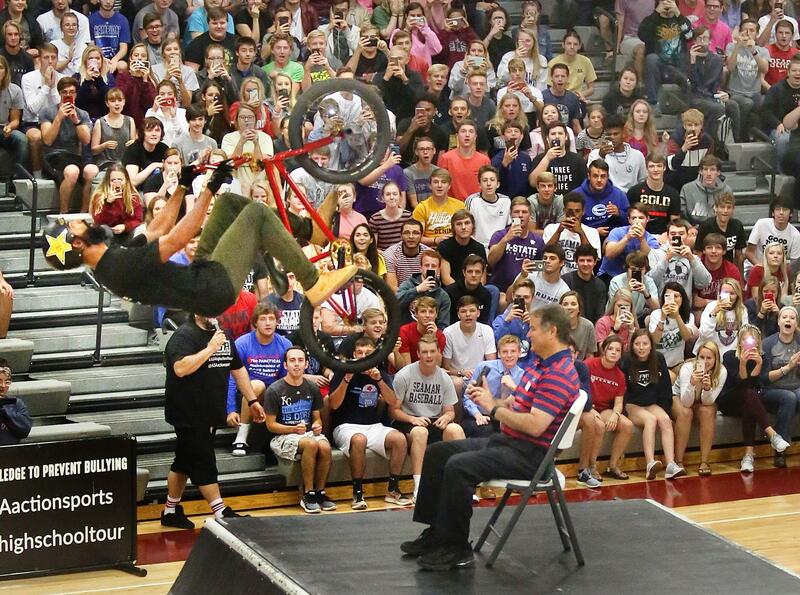 The event featured some high-flying athletes doing stunts on their BMX bikes while show emcee Micha Kranz shared statistics on bullying and tips on stopping it. Kranz noted it can be hard to connect with high school students. The goal is to get their attention with the action sports, and then get them to listen to the message. “We don’t tell them how to live. We don’t tell them they’re doing bad things. We just give them information that they can make decisions with moving forward,” he said. Principal Mike Monaghan started the show by rolling across the gym on his 1970s-era skateboard. Before the event began, he said students participated in their seminar classes on a social-emotional lesson on cyber bullying. “It’s a good way to get them ready for this assembly, where the message is a good one on bullying prevention,” Monaghan said. The event showed off the skills of four talented BMX athletes, all of whom have participated in the X Games. Koji Kraft, who just came off a tour with Ringling Brothers and Barnum and Bailey Circus showing off his skills, was the first to send his bike up in the air off the ramp in the center of the gym floor. Jake Hinke, known as the heartthrob, followed. He is an Olympic hopeful thanks to BMX and skateboarding being included in the next summer games. Mykel Larrin earned a Big Air bronze medal in the 2015 X Games and has participated in Bikes over Baghdad, performing for U.S. troops in the Middle East. Bullying is a lot more rampant now with social media than it was when he was younger and you had to meet the bully face to face, he said. All of the performers have faced bullying at some point thanks to their non-traditional sport, Larrin said. That point was also made by Dane Beardsley. He is known as a flatlander, where all of his tricks are performed on the ground with a bike without breaks. He spins it around, upside down and sometimes takes his hands completely off the bike for a long as he can before his feet touch the pedals. He also has an education degree and is a secondary substitute teacher when he’s not on tour. The event was sponsored by the Marines, so it was free to the school. However, it wasn’t used as a recruiting tool. The grand finale of the morning was Big Air Larrin flipping his bike over the top of Monaghan, who sat in a chair at the top of the ramp. Monaghan had his cellphone out to video the jump but actually flinched and closed his eyes while Larrin sailed overhead. All the performers shared the same anti-bullying message encouraging students to stand up for themselves and to speak up when they see bullying occur. Also, they wanted students to not be afraid to ask for help from a trusted adult. This entry was posted in Homepage Featured, News, News Coverage by Matt Dutiel. Bookmark the permalink.